Come to City Hall on Saturday, December 19th to meet the wonderful cats that are in Humane Society Foster Care. These cats will be available for adoption that day. 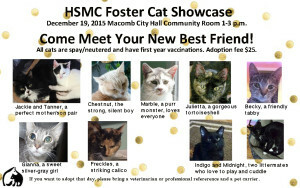 You will need a veterinarian or professional reference and a pet carrier to take home your new addition. We have a few kittens, adult cats, and a wonderful mother-son team. Jackie and Tanner, the mother-son duo have a sponsorship from Walks with Kate.